Artist Michael Shaw’s sculpture is original, dynamic and fun. In this exhibition, Michael Shaw: Sculpting the Museum, he responds to artefacts from RAMM’s collections using metals, plastics and natural materials, using laser cutting and rapid prototyping. His sculptures are displayed alongside the original artefacts as a 21st-century Cabinet of Curiosities. Michael Shaw is best known as a sculptor who works with inflatable structures to express his interest in space, light, translucency and transparency. He has responded to other historic buildings including Burghley House in Lincolnshire; Bethesda Chapel in Stoke-on-Trent; the Victoria & Albert Museum, London; and the Varna Palace in Aarhus, Denmark. He has also exhibited in Berlin, Florence, Hamburg, Paris, Rome and Tokyo and was shortlisted for the Jerwood Sculpture Prize and the Lynn Chadwick award at the Royal West of England Academy. Michael Shaw: Sculpting the Museum runs from 17 September to 13 November and is free to enter. An evening talk by Michael Shaw on Friday 16 September, 5.45 to 6.30pm, costs £8 and includes entry to the 6.30 to 8pm preview. For more information contact Rob Mackenzie, Marketing Assistant, on 01392 265317 or robert.mackenzie@exeter.gov.uk or Steve Upsher, Media Relations Officer, on 01392 265103. The Royal Albert Memorial Museum & Art Gallery (RAMM) is one of Exeter City Council’s flagship services. 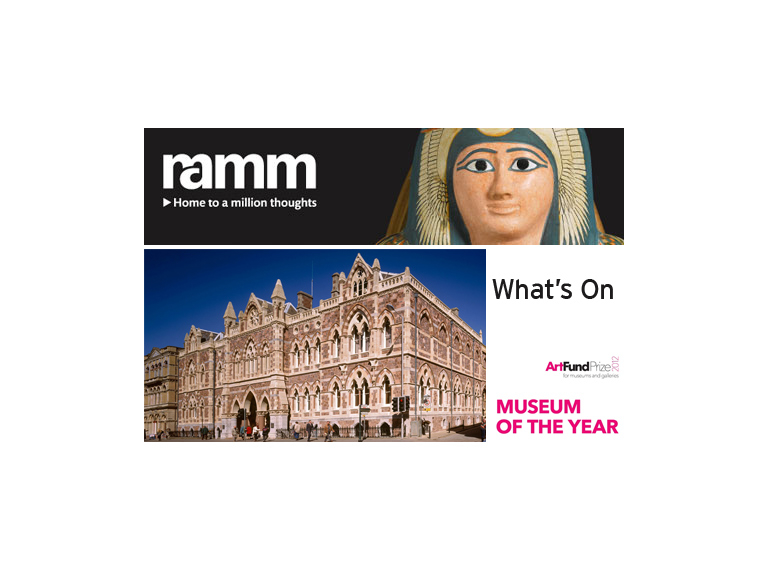 RAMM is also supported using public funding by Arts Council England. Stunning displays reveal Devon and Exeter’s rich history and global connections. Exotic animals, birds and insects delight children and a changing programme of exhibitions and events means there is likely to be something different to see on every visit. Free entry gives everyone the freedom to visit many times and to stay any length of time. Awards and standards include Museum of the Year 2012, the Arts Council Designation Scheme, Devon Visitor Attraction of the Year 2012, Collections Trust Best Practice Award 2013, RIBA South West Special Award for Conservation and Building of the Year 2013, the Accreditation Scheme for Museums in the United Kingdom, Inspiring Learning for All, 2012 Silver Tourist Attraction Award in the South West and Trip Advisor Certificate of Excellence 2015. The Royal Albert Memorial Museum &Art Gallery is in Queen Street, Exeter EX4 3RX. Phone 01392 265858. Web: www.exeter.gov.uk/RAMM Email: ramm@exeter.gov.uk or www.facebook.com/RAMMuseum and twitter.com/RAMMuseum. Free admission. Open 10am to 5pm Tuesday to Sunday. Closed Mondays and bank holidays. Sign up for email bulletins at www.exeter.gov.uk/RAMMmail.